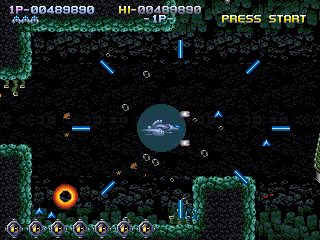 SideLine is a 2D side-scrolling shooter for DOS computers, created in the mid-90's by a Taiwanese group called EMAG (Electronic Music and Animated Graphics, also GAME backwards). EMAG was born when a group of people, some of them students in Taiwan's National Chiao Tung University, gathered together and pursued their dream of creating games. Most members had never developed games nor run a company before, so they learned by doing. SideLine was their first game but it sold poorly and soon EMAG was barely able to remain active, only supported by its later games 3DCop/ADCop and BonBon Paradise, both light gun games. Soon most members left and established a new company, and EMAG closed soon after, having created only three games. Some time after SideLine's original 1996 release it received a very limited western release in Poland. A company called Union Systems localized the game with Mirage Software publishing it. The print run was only 3000 (or possibly as little as 1500) copies. Though the companies contacted other publishers hoping to release it elsewhere as well, nobody was interested. The Sony Playstation was released just a short while earlier and mainstream gaming had little interest in the "old-fashioned" 2D shooting games that were so prevalent in the Super Nintendo and Megadrive/Genesis days. The game was left to obscurity, known only to few. 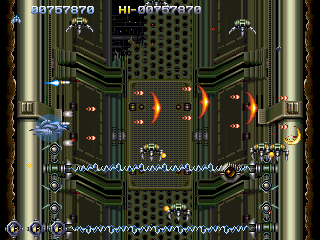 16 years after the game was first released a Spanish online blog Retro Maniac Magazine wrote an article about the game's demo version, leaving many wondering if the game's full version would ever surface. Some months after that the Polish release was indeed found and many gamers were finally able to try the game out for the first time. A recent interview to the same online blog sheds a bit more light into EMAG's story. The company also has an official Facebook group now. In October of 2013 we received permission from the game's producer Jiun-Ming "Jimmy" Hwang to distribute SideLine's original version as long as no profit is made for it. We hope you enjoy it as much as we have. The game is not only good for its time, but is a good representative of the 2D shooting game genre as a whole that's still fun to play today. 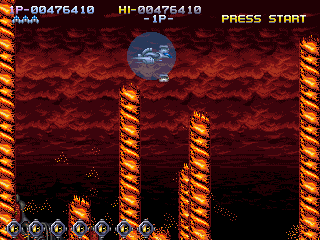 There's a good variety of weapons, the stages are fun, the bossfights will keep you on your toes...if you are a fan of games like R-Type and Gradius, you'll feel right at home with SideLine. 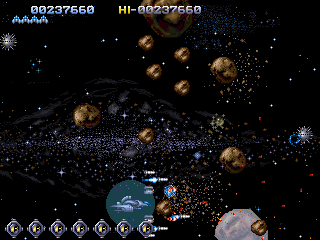 The game even has a simultaneous two-player mode, which not many DOS 2D shooting games can say. Click here to download the .zip file with the .bin and .cue files. Download size is 519 MB. DOSBox, this guide assumes version 0.74 is used. Jemm, specifically JemmEx which is included in the .zip file. Extract the .bin. and .cue files from the .zip into a folder. The rest of the guide will use D:\Games\SideLine as the folder with all the files. Extract JEMMEX.EXE from the Jemm .zip file to the same folder. - Under [cpu] change "core=auto" to "core=normal". - Under [dos] change xms, ems and umb to "false". Start DOSBox. Mount the folder that contains the SideLine folder as drive C (mount C D:\Games) and the image file as drive D (imgmount D "D:\Games\SideLine\sideline.cue" -t iso -fs iso). Go to the D: drive with "D:" and type "install" and hit Enter when at the SideLine CD Installation Program. This will copy all necessary files to D:\Games\SideLine. Now type "jemmex noems load". You might get an error message "System memory found at c800-efff, region might be in use" but as long as it also reads "JemmEx loaded", it's alright. An optional step: Type "dossetup" to check and change some of the game's settings, most importantly the controls. 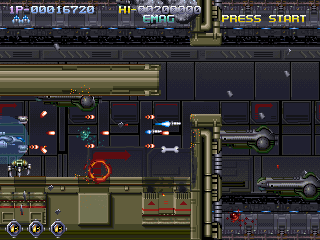 The game defaults to using the arrow keys for moving and Left Control, Left Alt and Left Shift for firing, changing option formation and bombing. You can choose to use your joystick for controlling here, but as the game will only allow to use two buttons out of the controller, forcing one button to be on the keyboard, I strongly recommend sticking with the keyboard control in the settings and using something like JoyToKey or Xpadder to map the keyboard controls into your controller of choice. Type "sndsetup" to set the sound settings. Run both "Select and configure MIDI music driver" and "Select and configure digital audio driver". You shouldn't need to change any of the default settings, just hit Enter a few times to go through both of them. And finally, type "play". The game should now start and you can begin playing! More information about DOSBox usage can be found at the program's own site. I would also recommend creating a .conf file and a DOSBox shortcut to make starting the game as easy as double clicking the icon, as any other program. To help with this, use the pre-made .conf file as that has everything ready to run the game. Just be sure to correct the game's installation folder and your virtual drive's letter near bottom if needed. And if you're running the game for the first time, be sure to change the last line from "main" to "snddsetup" to set the sound settings, then change it back to "main" afterwards. If you want to create your own .conf file, be sure to use the "core=normal" setting, as using "auto" or "dynamic" will make the game prone to crashing. And remember to disable the xms, ems and umb settings. 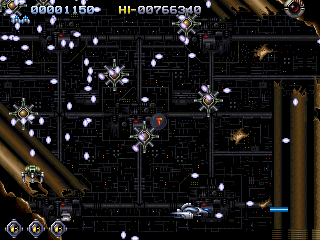 Eagle-eyed users might notice that the CD image also includes files for running the game natively in Windows 95. The game also indeed comes with a Windows 95 version, but the DOS version is much easier to get working so no instructions will be provided about that. There is also, apparently, a way to play the game over a network, presumably with Player 1 on one computer and Player 2 on another, but this is probably limited to the Windows 95 version only. Thanks to EMAG for creating the game and especially Jiun-Ming Hwang for giving us permission to distribute it and information about the company's history. Thanks to Piotr Drapich of Union Systems for providing background information about the game's Polish release. Thanks to Pin for providing information, translations, files and getting in touch with the original developers.